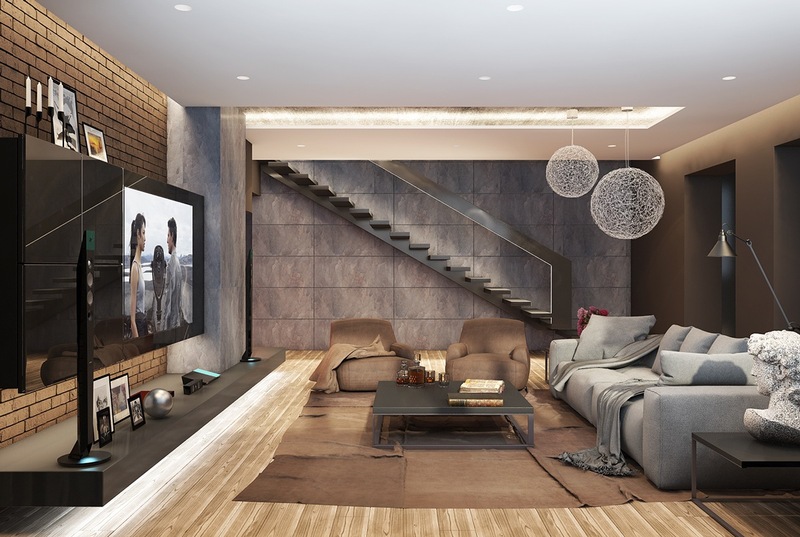 Lighting plays an important but hard-to-define role within the home. It's not just a tool to illuminate the home on dark days, yet it shouldn't serve as a purely decorative piece of furniture either. 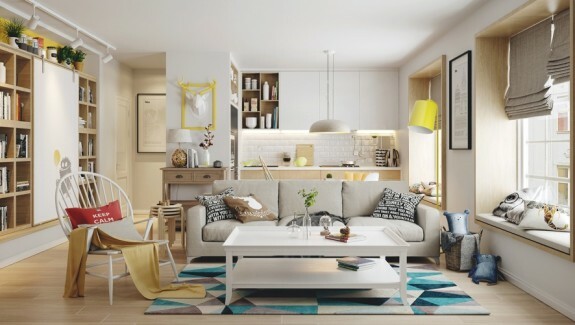 A designer would certainly never want to start chasing stylish lighting ideas without thinking about the quality and intensity of the bulb, or without considering how the light interacts with the other elements in the room. 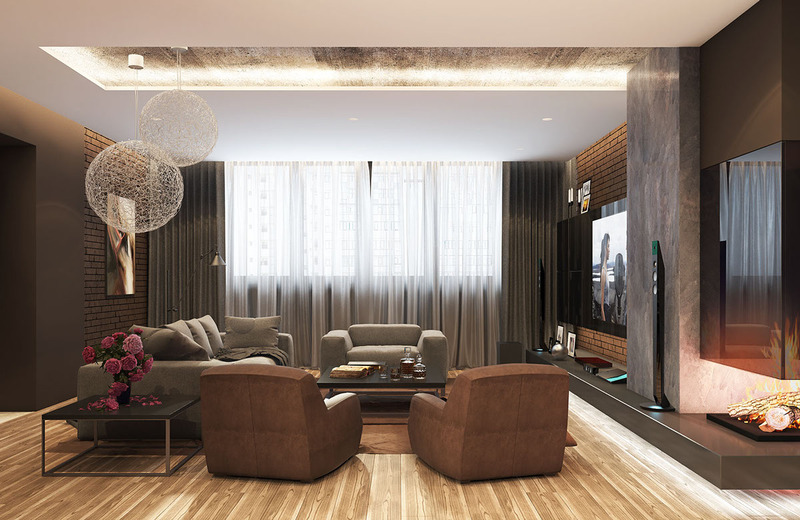 This post looks at 5 living rooms – each with a signature lighting style – so you can see the variety of ways to seamlessly integrate your lighting theme. 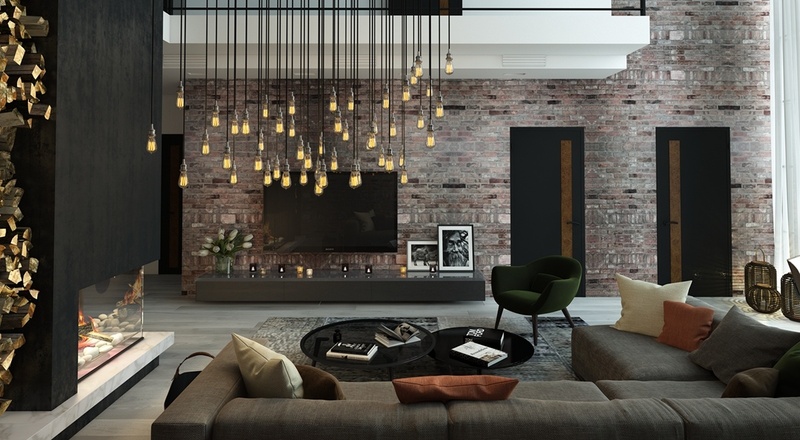 Are you excited to explore new creative lighting styles? 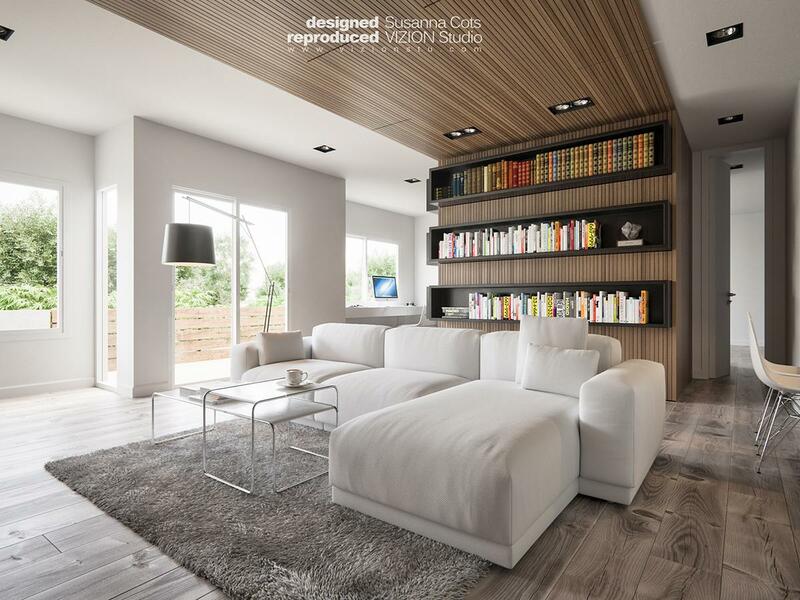 VIZION Studio visualized this living room interior based around a distinctive bookcase. 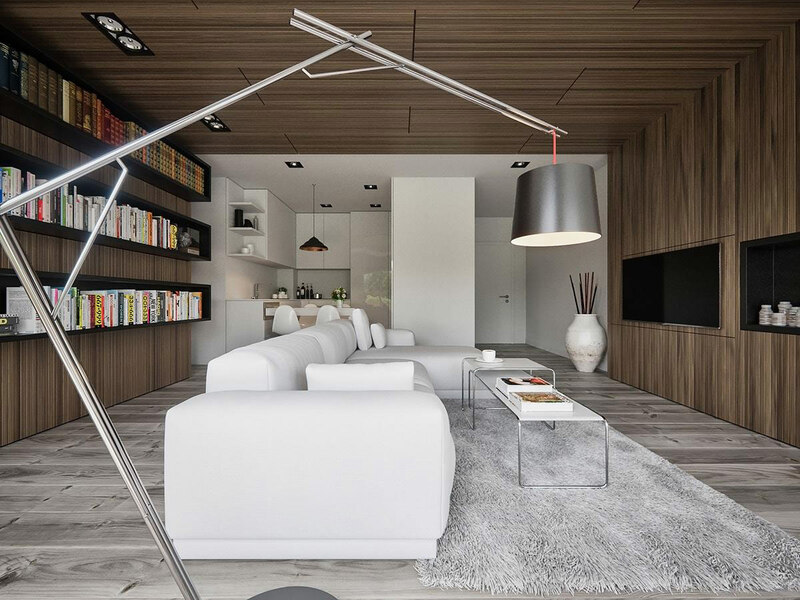 Smart recessed ceiling lights illuminate the crucial areas, and a cool floor lamp provides convenient task lighting for reading that perfect book once chosen. The result is sleek and cohesive, certainly making it easier to decide whether to go out for the weekend or remain at home with a good book. Sometimes one statement piece can change the entire attitude of an interior. Unlike many other lamps of this type, this one straddles the line between minimalistic and industrial just perfectly. It lacks the complicated pulley systems of similar lamp styles in favor of a cleaner aesthetic. Of course, we can’t let this home pass by without mentioning that incredible bookcase with its attractively sorted volumes on the top shelf. The way the light plays across the unfinished concrete contributes a huge amount of character to an otherwise subdued lighting theme. 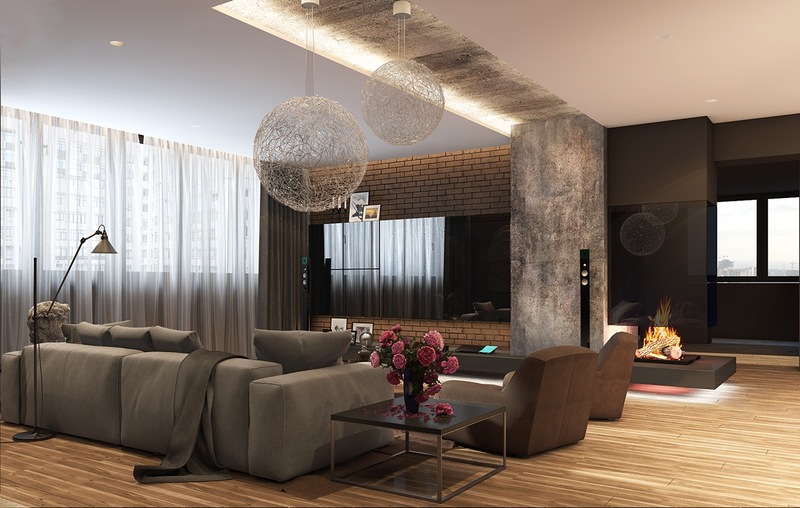 Designed by Sergey Procopchuk, this living room centers around a pair of gorgeous spherical pendant lamps suspended over a simple seating arrangement. The lights are from the Random Light collection from Moooi, a stunningly popular design by Bertjan Pot. The organic squiggles perfectly complement the earthy color palette and smooth edges of the furniture. 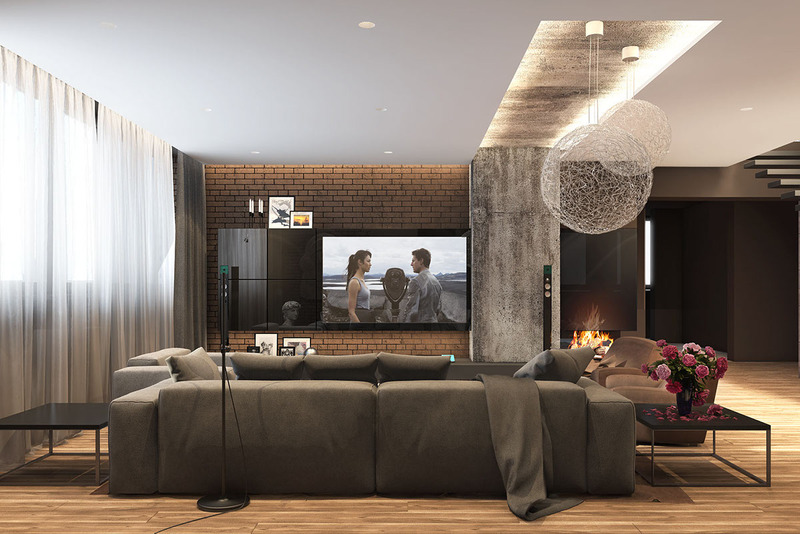 Exposed brick complements the unfinished concrete to create a very urban accent wall amongst a modern and streamlined interior. 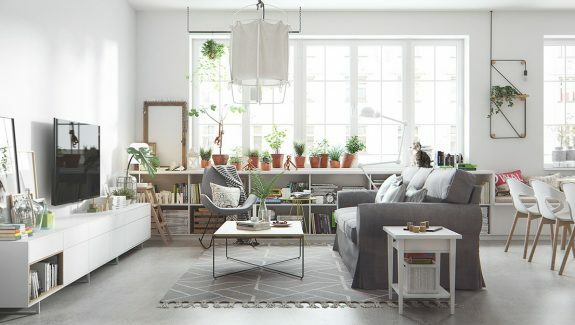 Tall windows provide ample natural lighting to go along with the laid-back vibe. Did you notice the adjustable task light in the far left corner? It’s just perfect for reading in the evening. 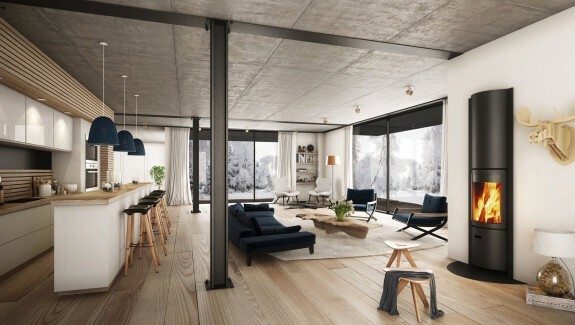 And of course, you can’t ignore that gorgeous cantilever fireplace to the far right. 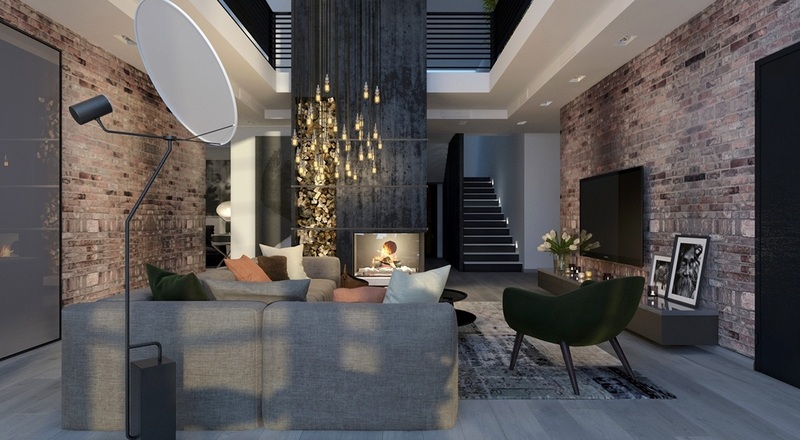 Other cool lighting features include the backlighting beneath the entertainment console, and the niche lighting applied in the recess containing the round pendants. Vertical wood storage is a popular trend. Putting firewood on display is more than just convenient: it helps establish a balance between the elements of earth and fire. 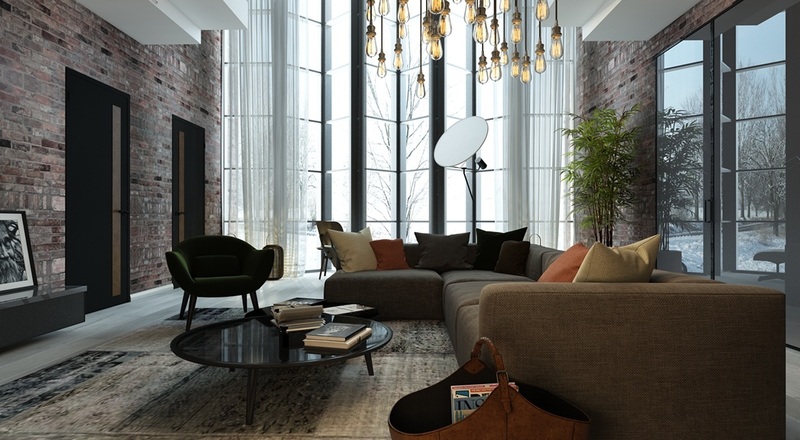 Elena Sedova visualized this elegant living room for the architects at Kupinskiy & Partners. 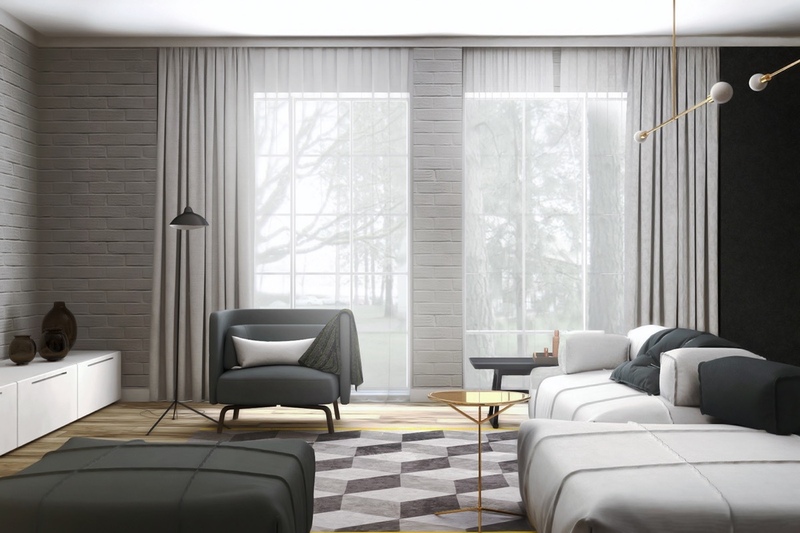 It’s a sophisticated and carefully curated home defined by its stunning double height windows and luxurious lighting solutions. 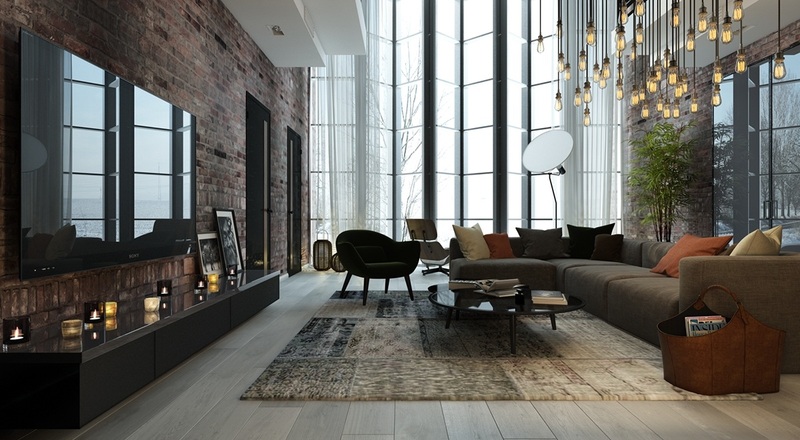 While the tall ceilings would ordinarily leave a lot of empty space left to fill in, this home utilizes tray ceilings and raw exposed brick to add visual interest between levels. 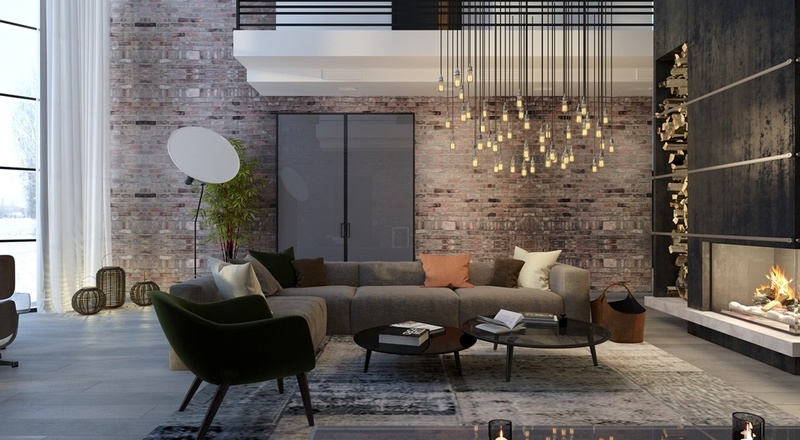 The signature lighting centerpiece is a bundle of Edison bulb pendants that drip down from the upper atrium level to illuminate the fireside spot on the sofa. 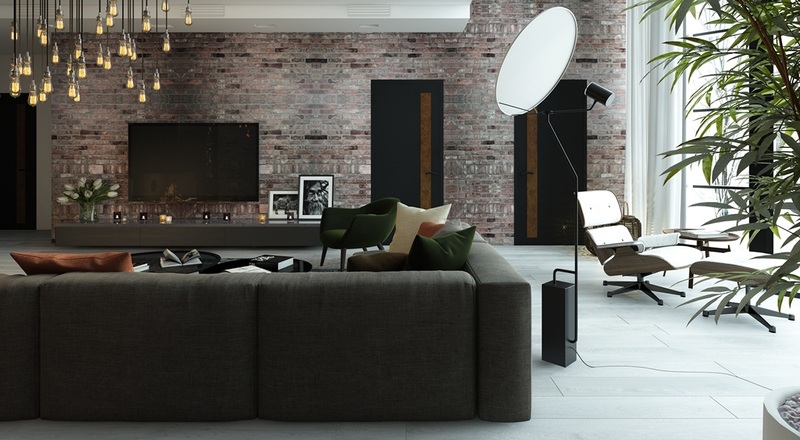 Black cords accentuate the feature lighting arrangement rather than serving as a simple facilitating factor. 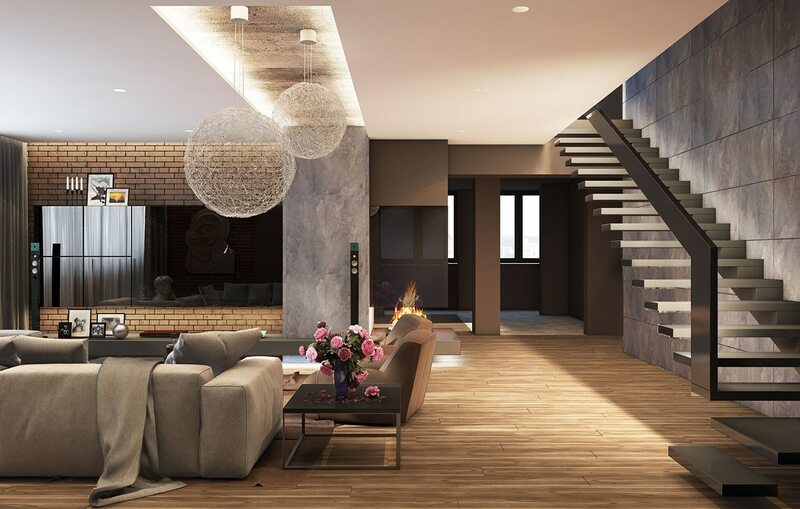 The smooth vertical lines come together to create an artistic piece that spans the levels of the home. Imagine how spectacular this scene must look at night! 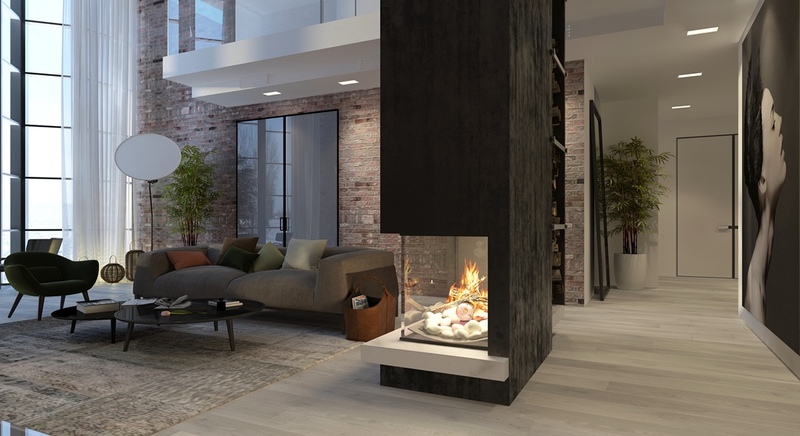 Of course, the versatile firewood niches add a decorative element all their own, a rustic counterbalance to the exposed brick walls and modern supporting materials. Task lighting is an important part of any social area. Here, soft ambient lighting is provided by the Full Moon floor lamp by Cédric Ragot. 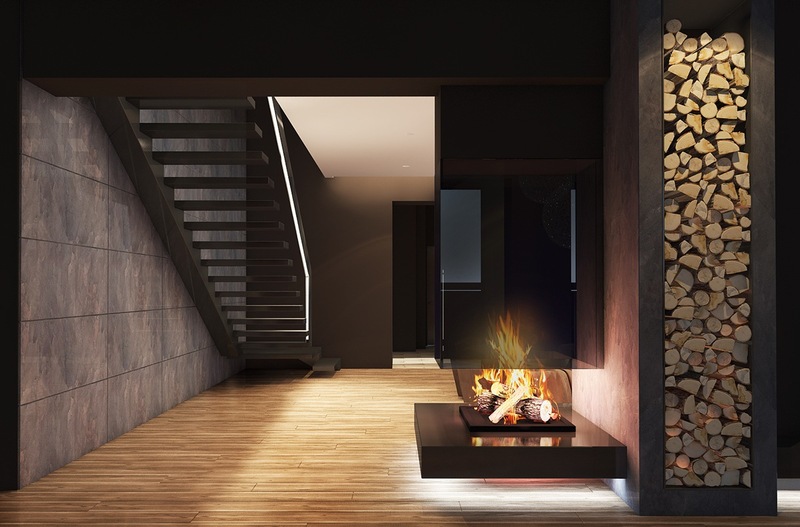 Regarding the ability to transcend floors, the same can be said of the freestanding fireplace structure with its tall matte black frame that also serves as a divider between the living room and the implied hallway that runs through it. An arrangement of candles reflects the warm feeling created by the comfortable autumn color theme used on the sofa. 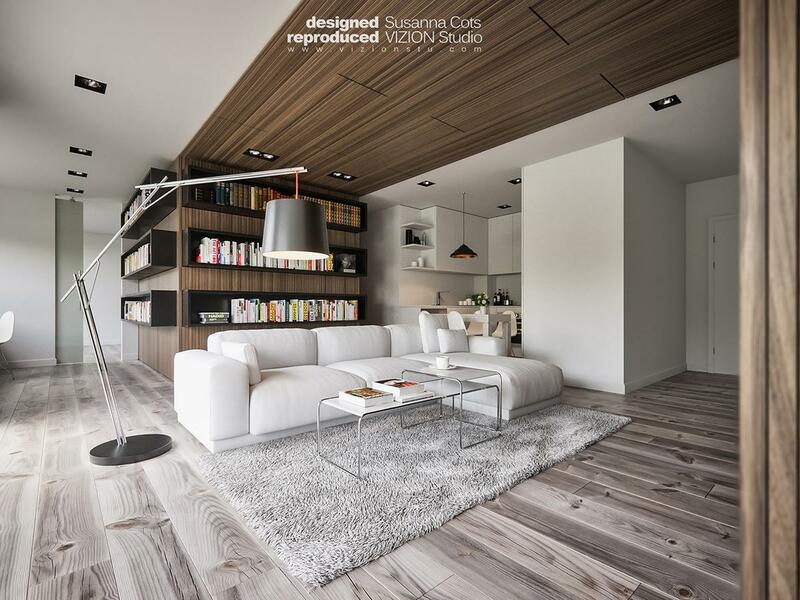 Simplicity – this living room, visualized by ReFL Studio, takes a simple approach to lighting in order to focus on the trio of portraits hanging above the sofa. Most of the utilitarian lighting is housed in simple black recessed fixtures in the ceiling. Accent light fixtures include a pair of AJ series lamps designed by Arne Jacobsen for Louis Poulsen Lighting, perfectly functional without overwhelming the interior accents used throughout the space. Brass bases further emphasize the AJ lamps. 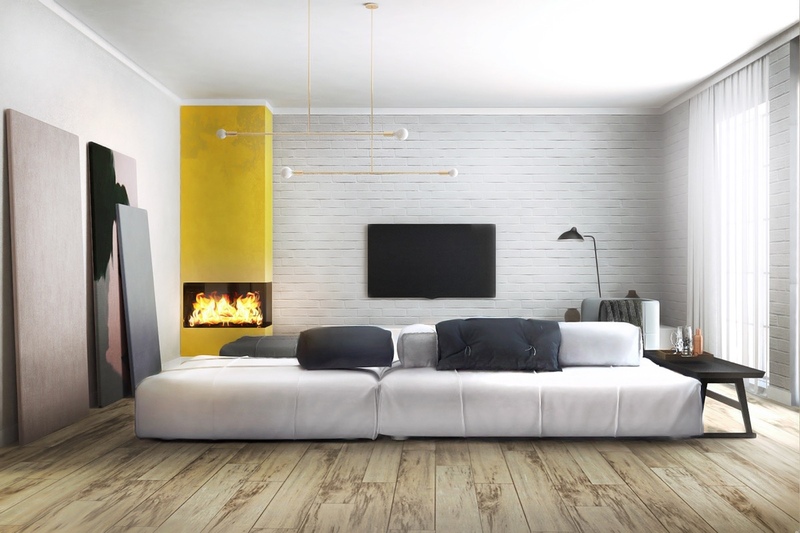 These radiant splashes of brass serve as the only accent color found in the entire living room. From above, it’s easy to see the smart interplay between the straight lines and the round decorative elements. The combination of steel furniture accents and brass lighting accents seem to combine to form some type of refined Bauhaus-style aesthetic. Beautiful! 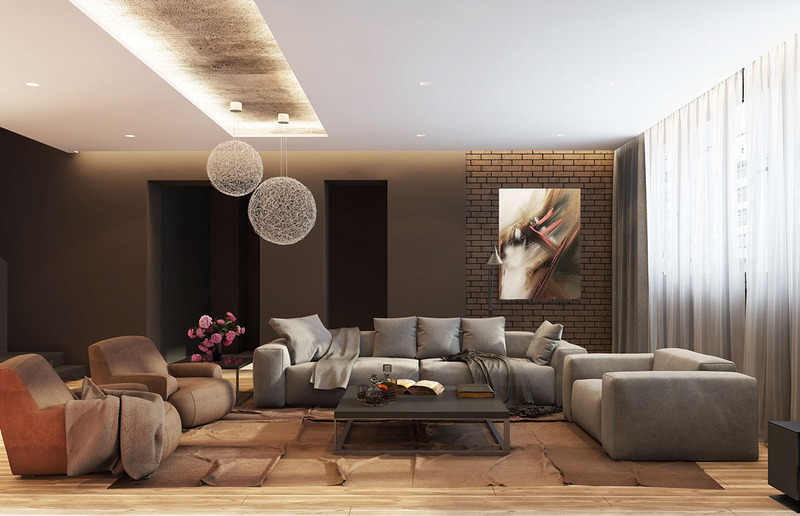 Tall artwork and creative color accents take main stage in this lovely minimalistic living room. Here, the centerpiece lighting arrangement includes two cantilever pendant lights with two bulbs each, perfectly balanced in a straight line. Their brassy tones bring out the distinctive yellow painted fireplace and stand in contrast to the subdued purples and blues of the canvases. 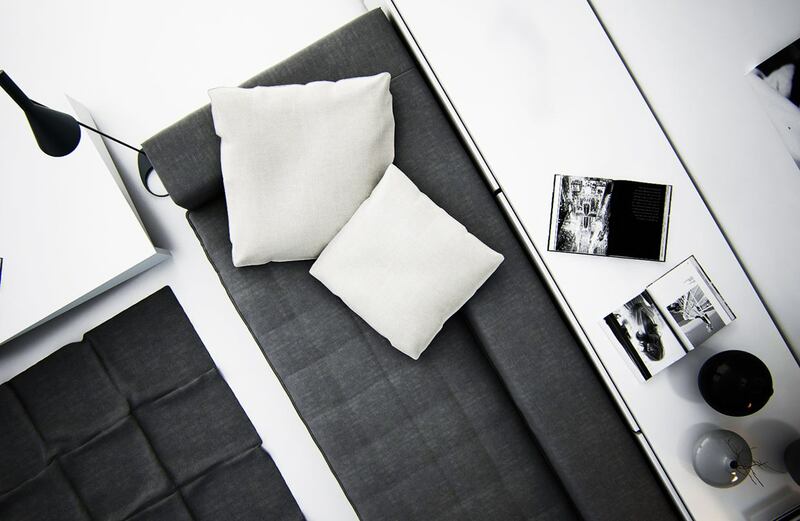 Together, the room does seem more like an art gallery than a living space – but instead of focusing entirely on the art, the point of emphasis is uncomplicated living. 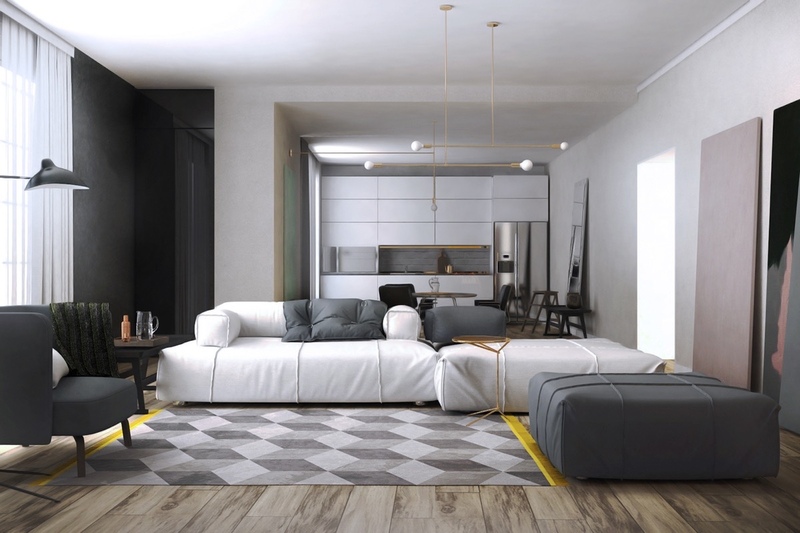 The edges of the geometric rug echo the yellow of the fireplace. In the background, you can see another cantilever lamp, this time protruding from the wall. 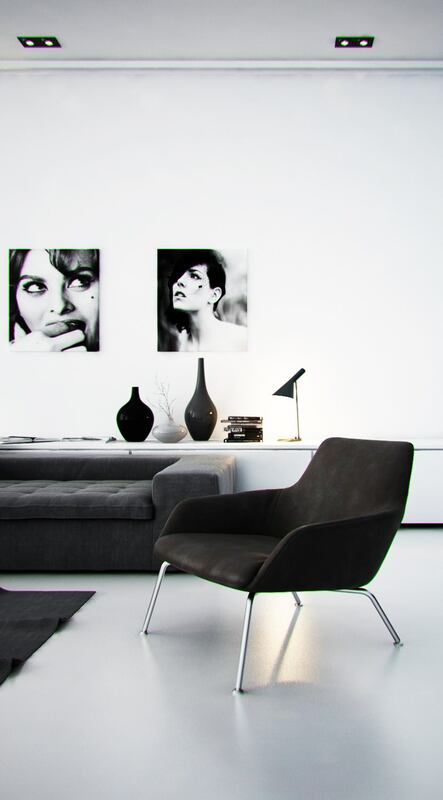 Illuminating the small reading chair near the window, Serge Mouille’s standing lamp makes quite a statement.